4'x10' UT Burnt Orange. Holds 8 chickens. "Them that honour Me, I will honour"...1 Samuel 2:30 Build Your Own! 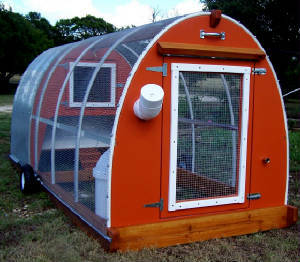 GO Green / A fresh, new, innovated approach to predator free .....Free Range Chicken Tractors. Construction Plans Available!!! 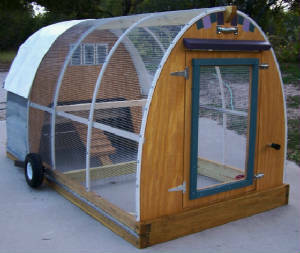 Get a jump on constructing your new mobile coop! "Click Here" To Order and recieve DIY PLANS through mail! 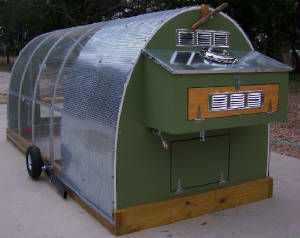 The Cadillac of chicken tractors! Designed primarily for the organic urban garden and landscape! 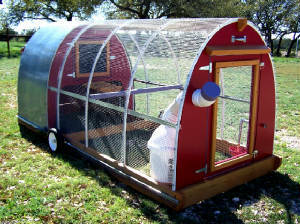 Check out our stagecoach plans for the most innovative cutting edge Mobile Chicken Coop Tractor Plans... for all year round use. Want to build your own? Coop Plans available! Deluxe 4'x10' Grapevine Green Mobile Stagecoach. 1. Extended roost area to three feet! 2. Plastic lined roost floor for easy cleaning! 8. Plastic nesting tray inserts for easy cleaning! 4'x8' Natural Stain. Holds up to 6 Chickens!